On Saturday night Patrick and I hosted a small gathering of friends and family for dinner and game night. 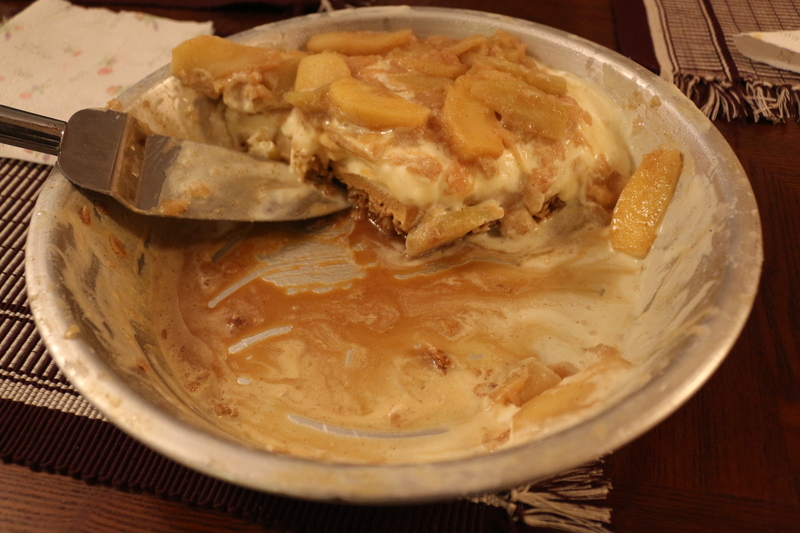 For dessert, I wanted something that incorporated apples but wasn’t too heavy. I ended up making a version of an inside out apple crisp recipe I found in my favorite cookbook, Sprouted Kitchen. Hope you enjoy! 2. 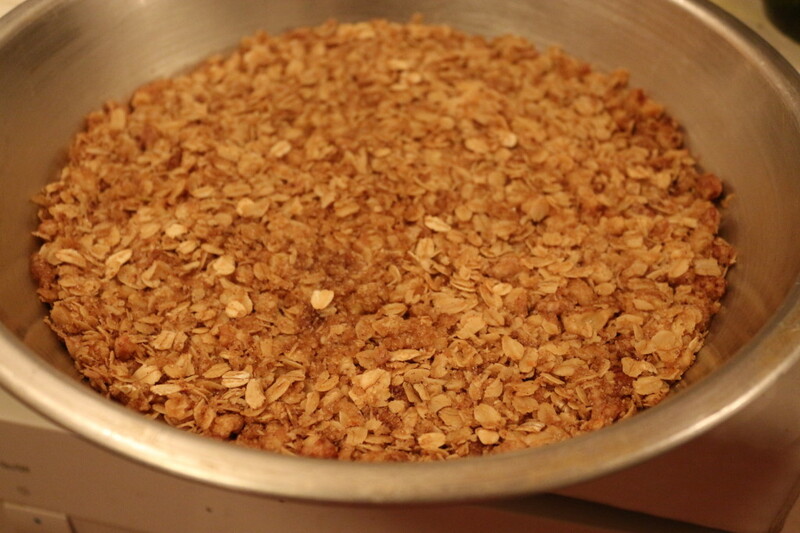 Mix together all the crust ingredients — oats, nuts, melted butter, 1/2 cup sugar, and 1 teaspoon cinnamon. Then, press the crust into the bottom of a pie tin. Note — I used a really big pie tin, so I could do all my crust on the bottom. If you have a regular sized pie tin, you should press your crust on the bottom and sides. 3. Bake the crust for about 10 minutes and take out of the oven to cool completely. 4. When the crust is cool enough, put the frozen yogurt into the crust. This is best if the fro yo is a little soft, and is easiest to spread if you dip a metal spoon into hot water between each scoop and spread. When the crust is filled, place the pie in the freezer for at least one hour and up to overnight. 5. When you are getting ready to serve, cook the apples — cook the 6 sliced apples in the butter until they start to soften, about 7 minutes. Add the cinnamon and vanilla and allow to cook another 5-10 minutes. This entry was posted in Sweets and tagged apples, cinnamon, oats. Bookmark the permalink.